I have just created my first ever crochet pattern. It’s just for one size, small, but can easily be adjusted to fit larger bodies. It’s quick and easy to crochet and soft and comfy to wear. I reckon it looks pretty good too. Here, below, is my pattern, free to all. Size: 10 (to fit bust 30 – 35 inches). Larger sizes can be easily made by chaining more to begin with and making a larger ring. Measure yourself around the widest part of your chest and make the beginning chain to fit this length. dc-dec: YO, insert hook into back loop of st and draw up a loop. YO and pull through two loops on hook. YO and insert hook into next st and draw up a loop. YO and pull through two loops on hook. YO and pull through remaining loops (three) on hook. sc-dec: Insert hook into back loop of st and draw up a loop. Insert hook into next st and draw up a loop. YO and pull through three loops on hook. 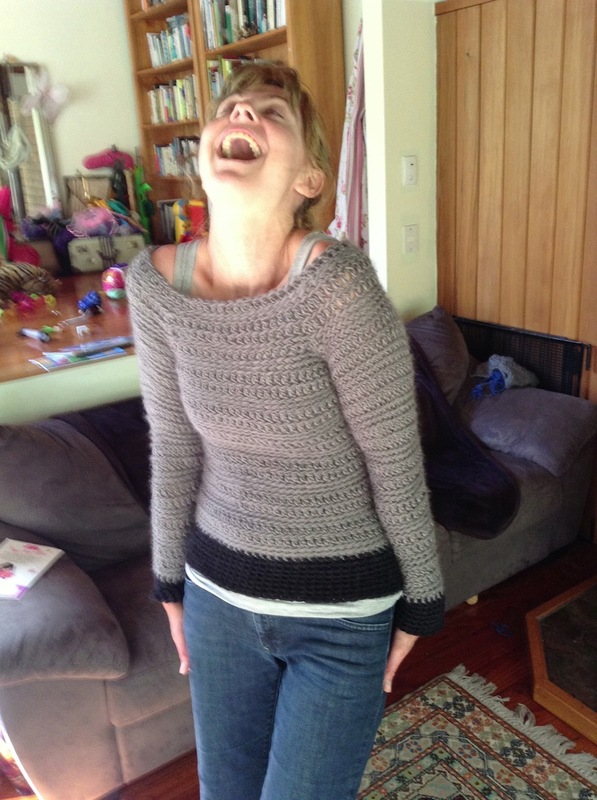 Starting with body of jumper working from waist upwards. All stitches are worked in back loops only. ch 76. Join with a sl st to form a ring (be careful not to twist chain). Row 1: ch 1. sc in each chain around. Join with sl st.
Row 2: ch 1. sc-blo in each st around. Join with sl st.
Row 3: ch 2. dc-blo in each st around. Join with sl st.
Row 5: repeat row 2, twice. Row 6: repeat row 3, twice. Continue working pattern (row 5 and row 6) until piece measures approx. 40cm in length or until desired length is reached, ending with row 2. Fasten off. Skip first 8 stitches, join to next st. ch 2 (counts as 1 dc), dc-blo in next 20st. Fasten off. Skip next 16 stitches, join to next st. ch 2 (counts as 1 dc), dc-blo in next 20st. Fasten off. ch 23. Join with sl st to form a ring. row 1: ch 1, sc in each st around. join with sl st.
row 3: ch 2, dc-blo in each st around. join with sl st.
row 7: increase row. ch 2, 2dc-blo in first st, dc-blo in next 10, 2dc-blo in next, dc-blo in next 9. join with sl st.
row 9: increase row. increase row. ch 2, 2sc-blo in first st, sc-blo in next 11, 2sc-blo in next, sc-blo in next 10. join with sl st.
row 13: increase row. ch 2, 2 sc-blo in first st, sc-blo in next 12, 2sc-blo in next, sc-blo in next 11. join with sl st.
row 15: increase row. ch 2, 2dc-blo in first st, dc-blo in next 13, 2dc-blo in next, dc-blo in next 12. join with sl st.
row 16: repeat row 3.
row 17: increase row. ch 2, 2sc-blo in first st, sc-blo in next 14, 2sc-blo in next, sc-blo in next 13. join with sl st.
row 19: increase row. ch 2, 2dc-blo in first st, dc-blo in next 15, 2dc-blo in next, dc-blo in next 14. join with sl st.
row 20: repeat row 3.
row 21: increase row. ch 2, 2sc-blo in first st, sc-blo in next 16, 2sc-blo in next, sc-blo in next 15. join with sl st.
Row 1: Join with sl st to side seam. sc-blo in each st around. Join with sl st.
Row 2: decrease row. ch 2, dc-blo all the way around but include 4 dc-dec evenly spaced around. Row 4: decrease row. ch 1, sc-blo all the way around but include 4 sc-dec evenly spaced around. Row 6: ch 2, dc-blo all the way around. Fasten off. Choose a contrasting color for sleeve and jumper edging. Join with a sl st to seam of sleeve. Row 1: ch 1. sc each st around. Repeat for second sleeve and for bottom of jumper adding an extra row to the bottom of the jumper. Posted in Crochet and tagged craft, crochet, crochet jumper, crochet pattern, jumper, pattern, wool, yarn. Bookmark the permalink. Thanks for sharing! The jumper looks great! Very clever, Rach! it looks lovely. You are so creative. Beautiful jumper. Beautiful figure. Great combination!! The sweater looks great! I’ll have to try one of these.. I am trying to make this jumper but can’t figure out how you are meant to sew on the sleeves. Any advice? Sorry for the delay in getting back to you. The sleeves are the trickiest part. Once you’ve made them, sew them to the body section at the underarms. Sew about 2-3cm across. Then continue in rounds as you were doing before but include the sleeves in the round. You’ll need to start decreasing stitches at this point and the tricky part is knowing how quickly to decrease. I had to unpick this bit once and redo it when I decreased too quickly the first time. It’s good to try it on the child as you go. I’m in the process of making another jumper in the same way, this time for my sun, so I’ll take some photos of joining the sleeves when I get to that bit. How does Christchurch look today?